The Silk Road’s convicted kingpin won’t get a new trial, a judge ruled today. A motion for retrial filed by Ross Ulbricht’s defense team was rejected by Judge Katherine Forrest. Forrest rebuffed several arguments about why Ulbricht needed a retrial, even after two of the federal agents working to convict him were caught stealing bitcoin. 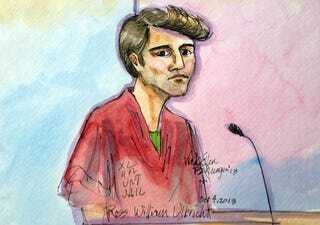 Those arguments had included that the prosecution gave the defense insufficient time to review the evidence in the trial, that warrantless investigative attempts to identify the Silk Road server had violated Ulbricht’s fourth amendment privacy rights, and that new corruption charges against a Drug Enforcement Administration agent and Secret Service agent required a new examination of whether the case had been tainted. This is bad news for Ulbricht’s defense team, since the questions of whether the warrantless server search was valid and whether the federal agents’ hijinks compromised the case were its two best chances for retrial. But it’s not the end: There’s still a chance to appeal the case in front of appellate judges, who may be more sympathetic than Forrest, who has already shot down five calls for mistrial.